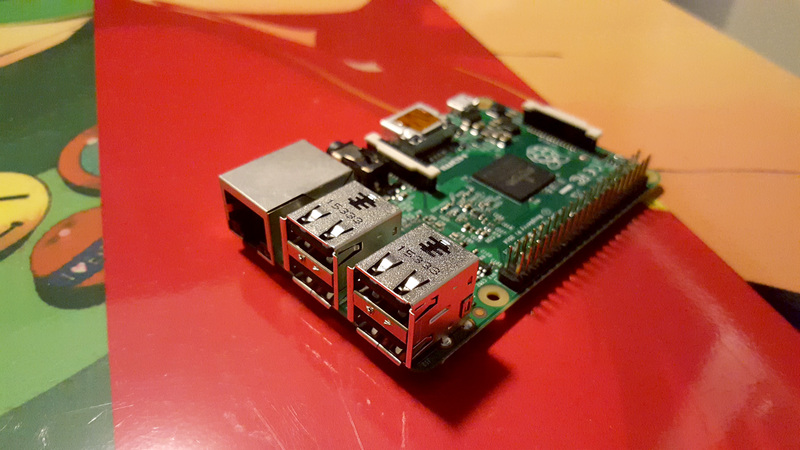 Someone on my Facebook feed was interested in seeing a build thread for my Raspberry Pi, so I figured here was the best place to do it. Feel free to contribute with your own Pi tales. 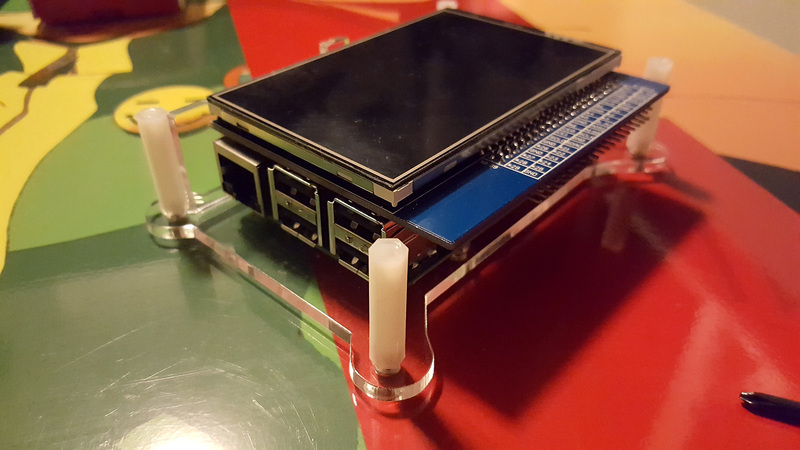 The Raspberry Pi is basically a tiny, Linux based computer. They can be fairly complicated if you want to do your own stuff with them, but for the more common uses, there's tonnes of tutorials and help out there. I have very little coding experience and I've been fine so far. I also have not had to do any soldering, but that may change depending on how I go about adding a speaker. 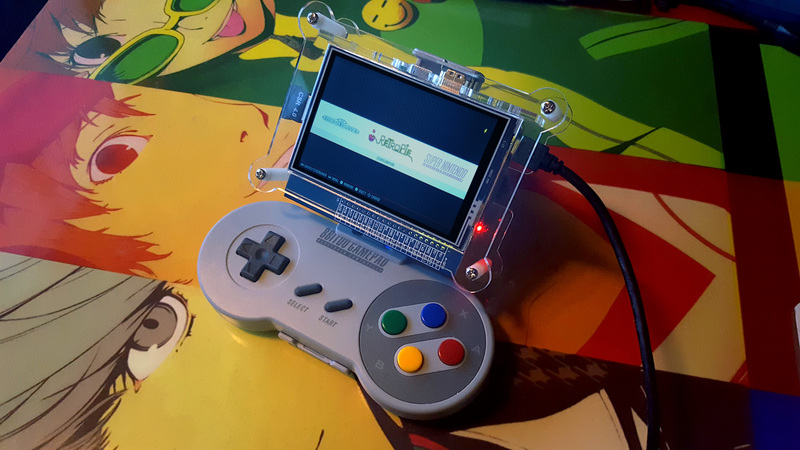 I've had the Pi set up as a retro station for a while, but decided I wanted to make more use of it and take it with me when I go away with work/on holiday (although getting it on a plane might be interesting). Rather than hoping the hotel room TVs have a HDMI socket, I thought I'd make the Pi completely self reliant. 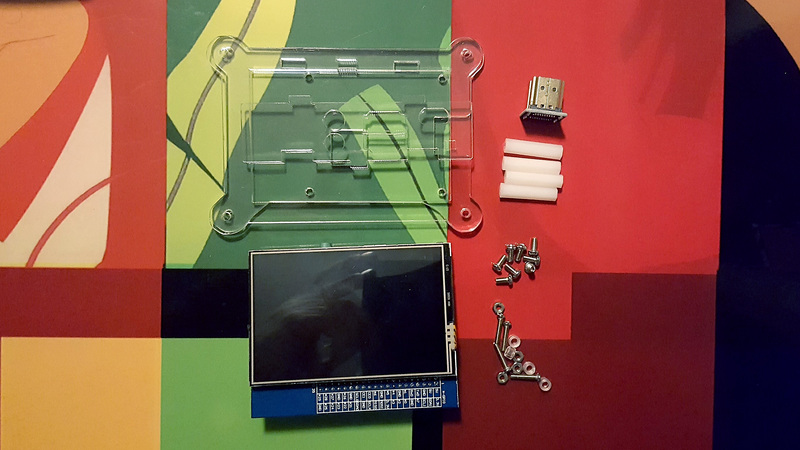 The screen comes in kit form and is super easy to setup. There were no instructions, but it's fairly straightforward. First step was to attach the Pi board to the backing plate, making sure to use the plastic spacers to hold the board away from the backing plate itself. This was probably the most fiddly part of the build so far. Then I clipped the screen onto the Pi board using the IO pins (the strip of pins at the bottom of each board, Pi is Male, screen is Female). The screen has an offshoot, so that these pins can still be used for other applications when the screen is attached. A nice little feature. There are also ribbon cables available to allow the screen to be located away from the main board if needed. Back view of the screen to show the pins to be connected (black strips at the bottom of each board). Then I attached the side panel and the HDMI connector. 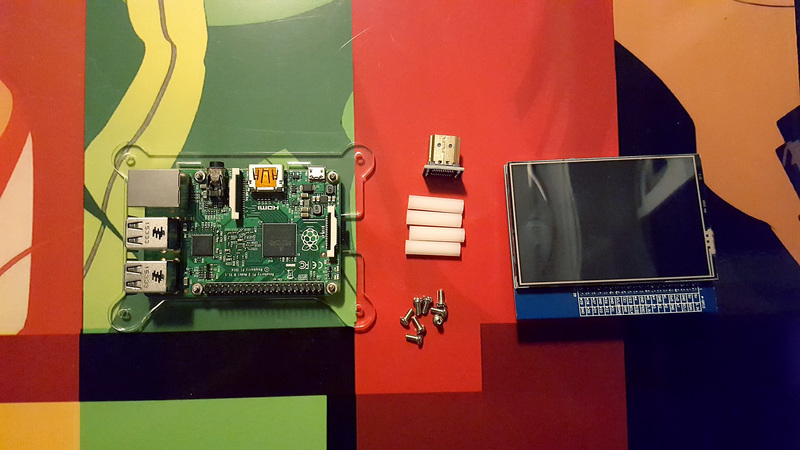 The pins and HDMI connector hold the Pi and screen together quite solidly, which is good as it's the only things holding them together. Then the top panel. The screen is exposed, as it's a touch screen. And that's pretty much it so far. The screen is plug and play, with a dedicated driver only needed if you want to use the touch screen. RetroPie doesn't support touch screen, so I have no need to install the extra drivers. There is a black border by default (shown below), but it's easy enough to fix by adding disable_overscan=1 to the config.txt file found on the memory card. I'm currently waiting for my 8Bitdo controller to show up, so I'm using a wired 360 pad for now. From what I remember, the 360 pad is plug and play, with only the key bindings requiring setting up. A keyboard had to be used at first boot. I've already tested the Bluetooth dongle and it works great with my PS4 pad. The touchpad just causes issues, so I just stick to the 360 pad for now. Once the 8Bitdo pad shows up, it's just a case of syncing it up via RetroPie and playing. 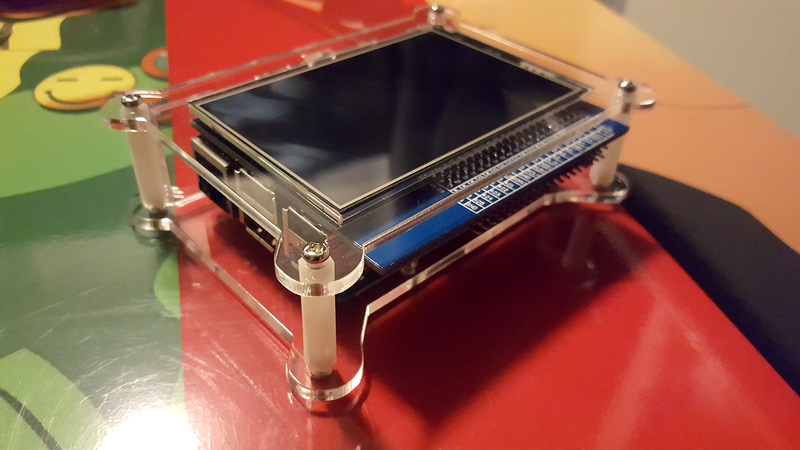 The Xtander will allow the screen to be mounted to the pad. One thing I've noticed is that the power cable used (micro USB) can make a difference to performance. I've had to make sure I'm always using a decent plug and cable, otherwise certain games stutter. I've tested it being powered from my TV's USB socket, my cars accessory socket and a decent wall plug and they all seem to work perfectly as long as I use a decent cable. Maybe fashion a more protective case. My controller showed up and it was an absolute pig to set up and it involved a lot of semi-useful tutorials and a whole load of trial and error. I'll post the process, mostly for my own benefit if I need it in the future. One annoying thing is that the controller clip covers the charging socket for the pad, meaning it can't be charged whilst attached to the Pi/Screen. Given that it's the official clip for the pad, I'd say that was a very poor design choice. The holes that allow the LEDs to shine through are a nice touch though. The pad itself is very nicely made. Imagine the classic SNES feel, but modernised. The buttons are still nice and chunky, but they just feel a bit tighter. The pad is also heavier, but nicely so. Feels nice and solid. 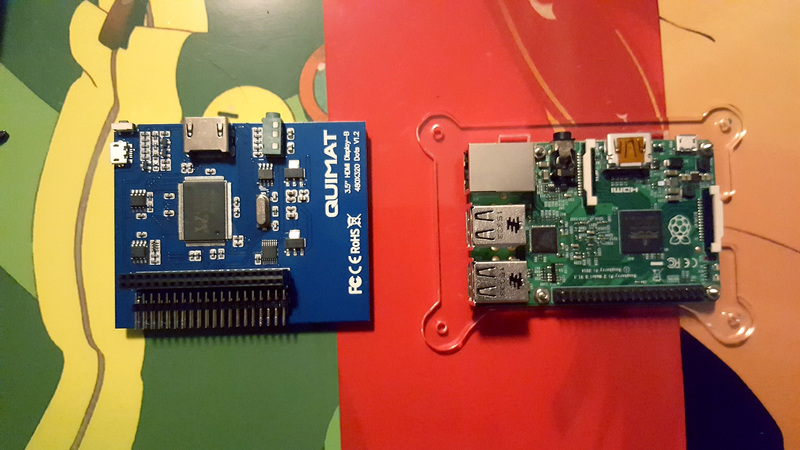 A sort of small, but also fairly significant update to the Pi: The main Pi 2b board is now gone and been replaced with a Pi 3 thanks to @Happenstance, who gave me his unused Pi. 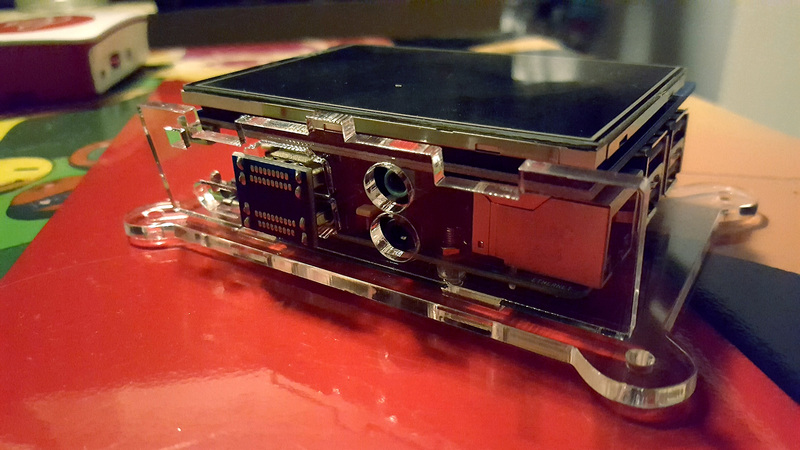 Due to all the storage being handled by a Micro SD card, it was just a case of putting the card into the new Pi and attaching the screen and syncing up the pad again. I bloody love how easy it is to switch parts on this thing. 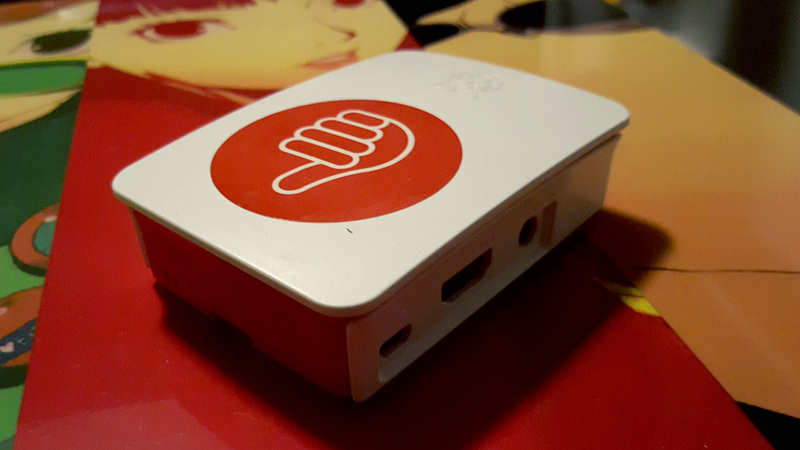 Thanks to the upgrade, the RetroPie station now features built in Bluetooth (much faster syncing and no ugly dongle! ), WiFi and a more powerful processor. 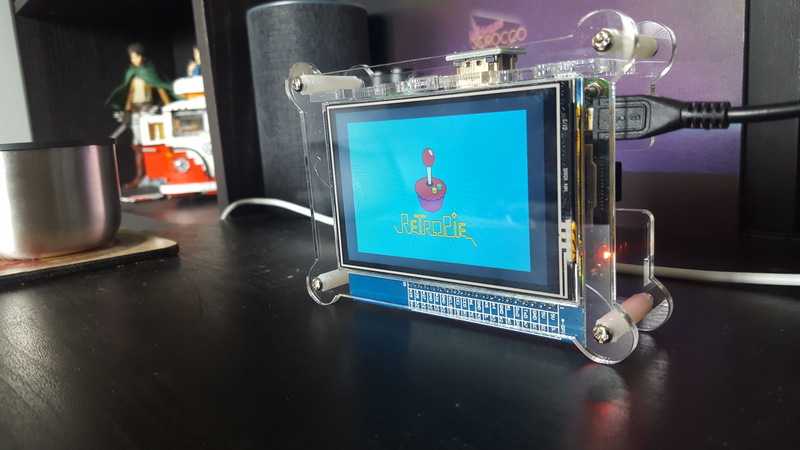 Might as well put this in the general forum.. Raspberry Pis aren't exactly soleley for retro gaming. Probably going to get one myself before the end of the year, but I have no intention of doing any retro gaming at all. 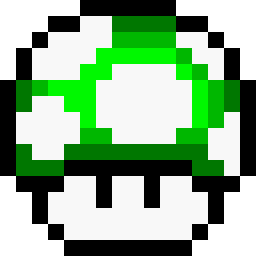 Mainly hosting my own website on it or something, and probably also for discord voicechat (as my computer makes too much noise). And I'll probably do some other experiments with it. But no gaming. I had one acting as a Homepass for the 3DS but that's been killed now I think since Nintendo ended the service. It got repurposed as a wireless VPN bridge and works pretty well. I've got a couple of them but don't really know what to do with them. 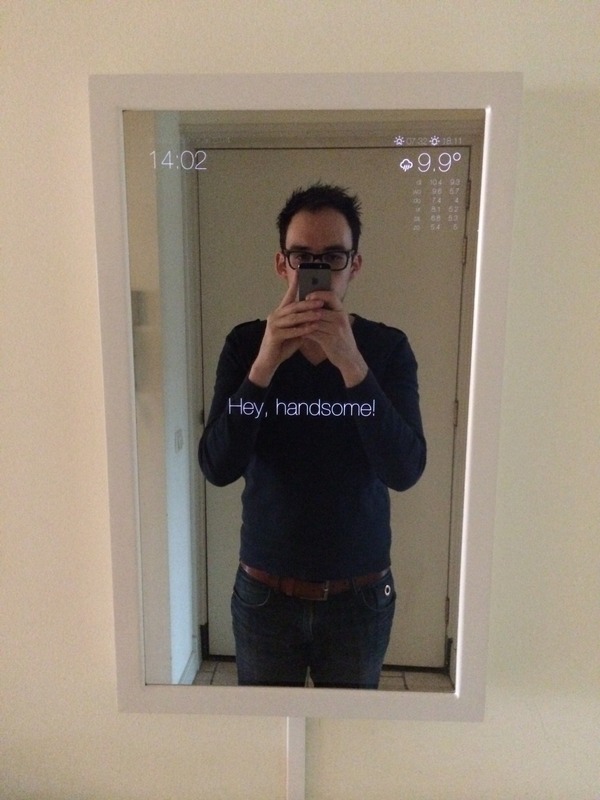 Oh wow, that screen looks dashing! I've been going back and forth about getting one, mostly because I was expecting an RP4 this year. I would probably use it as a media center, for series, movies and music. But a little bit of retro gaming is also an option. Yeah like @Sméagolmentioned, it is great for a lot of stuff. I know people who use it as a security center and pass all their mobile data through it as a firewall. Or use it for home domotica. Mail server, website server. Or build an arcade cabinet around it! After @Vileplume2000 snapped a complete set up today for 50 euros, I really want one for myself, even though it's mostly going to be used as a hosting server, as I don't have the skills (yet) for the stuff in the video. The Pi now has portable power. It's a bit bulkier than I'd have liked, but it does last forever. I haven't attached it to the main unit, as it would make it too heavy, so for now it just serves as external power. Makes a nice base if I use it as a tabletop unit though. Also got given a pop socket in a sample pack from a supplier at work, so it can now stand up if needed. 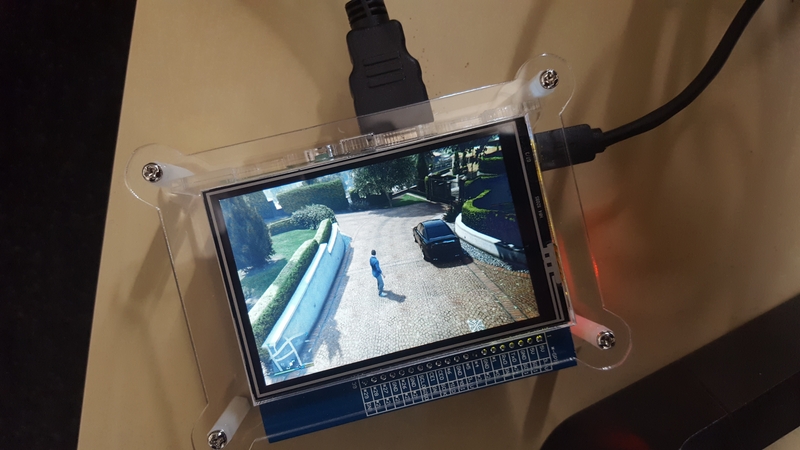 Posting this from my brand new raspberry pi! Cool! I'm sad to say mine is still in the box, got it a couple of months ago... I think I need a good plan to use it for.